BLESSING OF ST. DOMINIC’S WELL: Thurs. Jan.5th, Fri. Jan. 6th, after 11am Mass. At St. Dominic's Well today, January 5 2017. Collecting the blessed water at St. Dominic's Well, today Jan. 5th, 2017. The annual Blessing of St. Dominic’s Well took place this Thursday, January 5th, and will take place tomorrow Friday January 6th (Feast of the Epiphany) after the 11am Mass. All are welcome! Please spread the word. 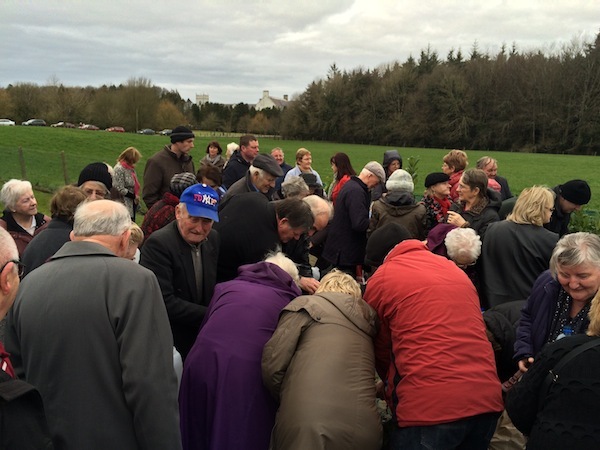 Click here for TG4 (Irish Station) for footage and interviews from the Blessing of St. Dominic’s Well. Broadcast Jan.6th, 2014, on 7pm Nuacht/News. 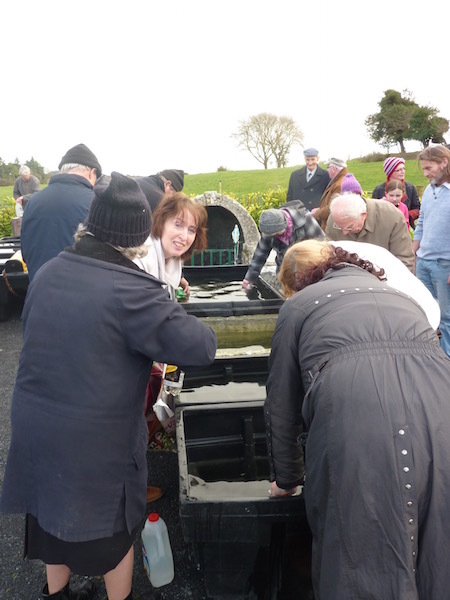 Click here for an account written by a woman who is doing her PhD on Sacred Wells in Ireland, who spent much of the day here on Jan 6th, speaking with people, and hearing their stories and memories. Great crowds turned out January 5th, and January 6th, for the Epiphany Mass and Blessing of the Well. The Church in Esker was packed, and many more in the corridor and in the room. Afterwards, we processed to the Well for the blessing, and a great slua of people had their canisters, bringing home the blessed water for themselves and for neighbours. May we all draw water from the well of Christ, and grow more and more in our appreciation that everything in nature is truly sacred and holy: our ‘blessings’ are our way of giving thanks for all that is given to us in nature and in ourselves. We live in a ‘divine milieu’, always. 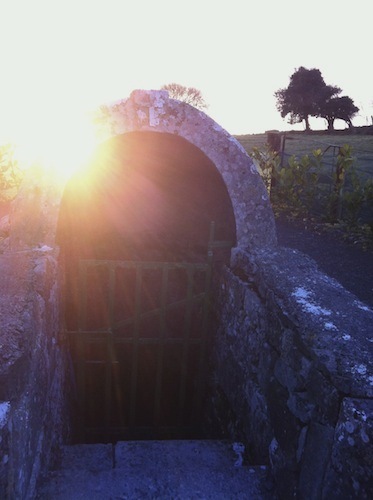 Dawn breaks over St. Dominic's Well, in Esker. The custom of blessing St. Dominic’s Well has been carried on for very many generations. When the Redemptorists came to Esker in 1901, the custom was well established. It dates from the times of the Dominican presence here in ‘Eiscir na mBrathar’,- Esker of the Friars. It may date back beyond their coming, also. People come to get water from St. Dominic’s Well, to bring home to their farms, lands, and animals. No one knows whether the benefits of its water come from the water’s own properties, or from the blessing! For whatever reason, we give thanks. The Dominicans came to the general area around Esker after Cromwell’s time in Ireland, – from around 1660. They hid in the woods at ‘Loch na mBrathar’ from 1705,- in hiding for their lives, as there was a price on the head of any priest or monk found in Ireland after 1698. In 1715, their little house burned down, and they were given a piece of land by the local Catholic landowner, on the present site of Esker Monastery,- on what was known then as Eiscir na Beithigh, or Esker of the Cattle,- on drier ground up from the nearby lake. Esker Monastery, therefore, has been a sacred site amongst the people of the West, for 300 years, – ever since 1715. Collecting the water at St. Dominic’s Well. 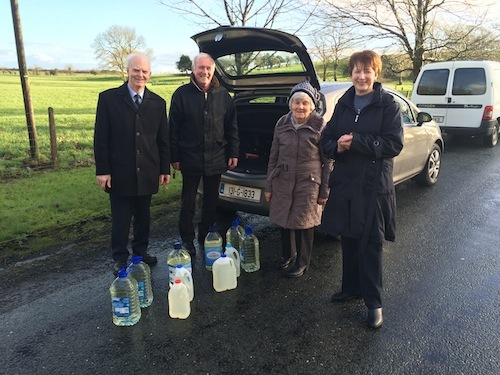 Going home to Glenamaddy, and to Roscommon, with water for the village! The following was written in the Esker Newsletter in January 2013, by the late Fr. Eddie Lynch (+Dec. 1st, 2014). before Christianity came. The large stone was the symbol of stability where peo- ple were conscious of their vulnerability. The well meant life. It was a source of life and fertility. 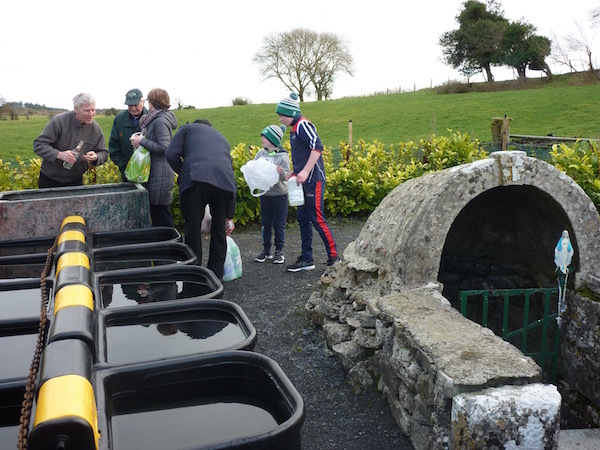 Esker is famous for Dominic’s well. It is a powerful spring, which lies at the foot of the 200 feet high Dominic’s hill. At midday on the vigil of the Epiphany, January 5, a stone trough beside the well is filled with water from it, then blessed with the ritual blessing for Holy Water, and taken away by the people to sprinkle on their cattle, sheep, horses and lands. The blessing of water is repeated as required until the evening of January 6th. Long ago, many people used spend the night of the vigil in local houses, having come a long distance. They went to Mass in Esker church the following morning, which was a holy day of obligation. For many years, it was the practice of the Redemptorists to preach a traditional mission sermon on this occasion. There is no devotion to the well itself. People do not go there to make the rounds or pray. The devotion is to the water that has been blessed. pre-Famine origin and may well have originated during a fever epidemic in the early nineteenth century. It is strange that the Dominican records make no refer- ence to this ancient blessing which draws such large numbers of people every year. Why the Epiphany blessing? Again, we do not know, but such a blessing is well known in the East. In the early church the Epiphany was a baptismal feast and, on its eve, springs and rivers were blessed, and the water drawn from them was kept for baptisms during the year. The Christians of the East (Greek Church) still have a solemn blessing of water at the Epiphany. Most other holy wells have their holiness from their association with a saint. This well has devotion to the water it contains, and to the blessing of that water on a particular day each year. Br. John Long told me that when his mother was a girl she was wakened very early on the morning of the 6th by the carts going by on their way to Esker for Mass. It would have been prior to the Redemptorists, I think. Our Response will be: BLESSED BE GOD, FOREVER. Lord, we thank you for increasing in us a deep awareness of the gift of water to us, and our responsibilities for the care of it as your gift. BLESSED BE GOD, FOREVER. Lord, we thank you for our greater awareness of the stresses on so many people, especially in the area of farming: thank you for our increased care and watchfulness for those among us feeling this pressure greatly: BLESSED…. PRIEST: Blessed are you, Lord God of all Creation. Through your goodness we have water, through your goodness we have land to care for, through your goodness we have animals and livestock and pets. We bless and thank you for our daily bread, and the gifts and blessings of each new day. BLESSED BE GOD, FOREVER. 3 Responses to BLESSING OF ST. DOMINIC’S WELL: Thurs. Jan.5th, Fri. Jan. 6th, after 11am Mass. I have had the privilege in attending two retreats in Esker the first in 2013 facilitated by Fr Daniel O Leary and in 2014 facilitated by Fr. Jim Mc manus , both were magical , Esker is indeed a very special place , solace for the soul , I will return , thanking God .